Sight is for a penguin as much important as for any other bird. Their eyes are so large that their eyeballs almost hit each other in their skull. In contrast to whales who orientates ultrasonic, penguins need to see to catch food. This means that they need a clear sight as well on land as in the water. While diving, their eyes are wide open and they trust on their sharp-sightedness and sense for light. The depth of diving is directly dependant of the intensity of light under water. Research showed that they dive deeper in the afternoon than in the evening. When we, humans, dive, everything is misty because the refraction of light is different in the water as in the air. Our eyes are so constructed that there has to be air before the cornea. 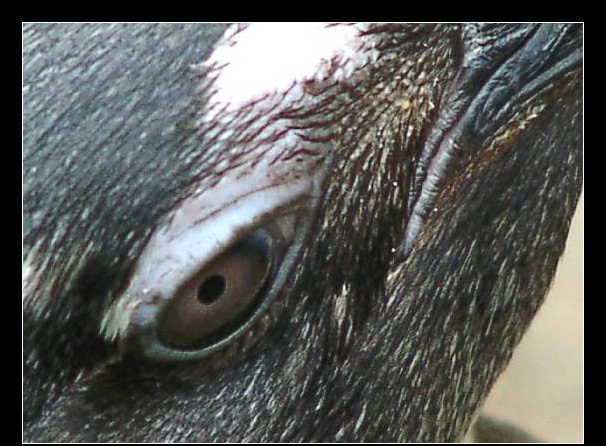 This is different for penguins: the surface of their eyes, the cornea, is not as much vaulted as for humans. So the difference between air and water is not so big and the light isn't refracted too strongly. 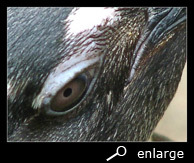 Besides, the lens, behind the pupil, has a large accommodation and can transform more because of the stronger eye-muscles, so a penguin has a sharp sight in the water. Although this has a disadvantage too: the visual angle reduces. To catch a fish, they need to estimate correctly the distance. The range of vision of the two eyes overlap only in a small area above the bill. This means that, under water, there is only a small area where they can see spatial, namely at an angle of 17 degrees for the bill. Because of this the depth of focus (binocular vision) is poor. To be able to still catch a fish, the evolution has developed a trick. 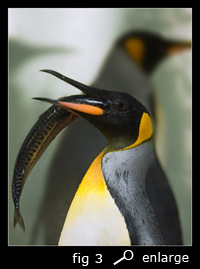 Research showed that a penguin turns his head and fixes the fish first with one eye and then with the other. Apparently the vertical angle of sight above the bill is much larger (about 80 degrees). So they can explore the surroundings spatial and determine the distance to their prey. Then they turn back the head and catch the fish, while seeing with the, spatial less, sight. 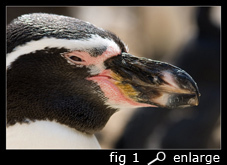 Prove for this is : African penguins always catch their prey from below and kill it by a bite in the belly, directly behind the gills. The sense for colours is also determined by the fact that they spend most of the time in the water. From a depth of 5 m under water, everything looks blue-green because the red and yellow daylight is filtered out. 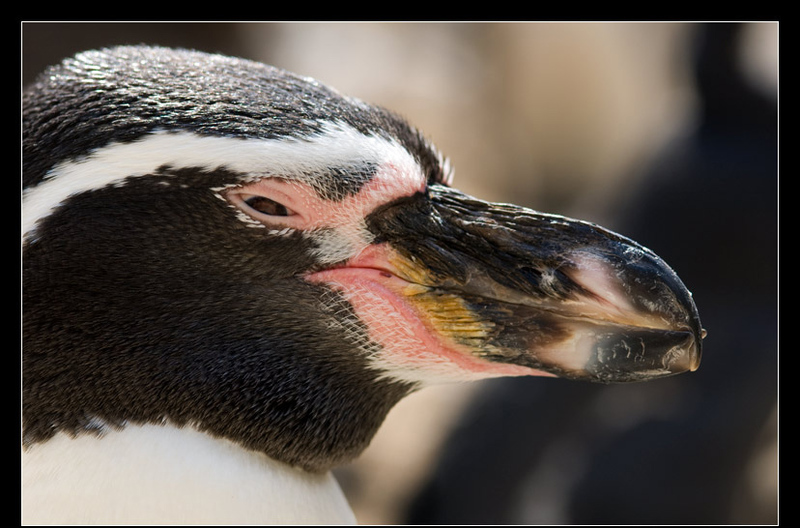 Therefore penguins don't see nuances of red colours, but the more nuances of blue and green colours.Research also proved that their sense for light is very developed, just as for nocturnal birds like owls. Although a penguin has no external ears, his sense of hearing is very strong. Their ears are on the same place as ours, but they only have an internal ear, covered with feathers. How else should he be able to find his partner or chick back in the colony. From the time they hatch, chicks mark the sound of the voices of their parents. So there can't be mistakes when the adult birds return from sea to feed their young. Finding a partner back is also based on the sound of the voice. 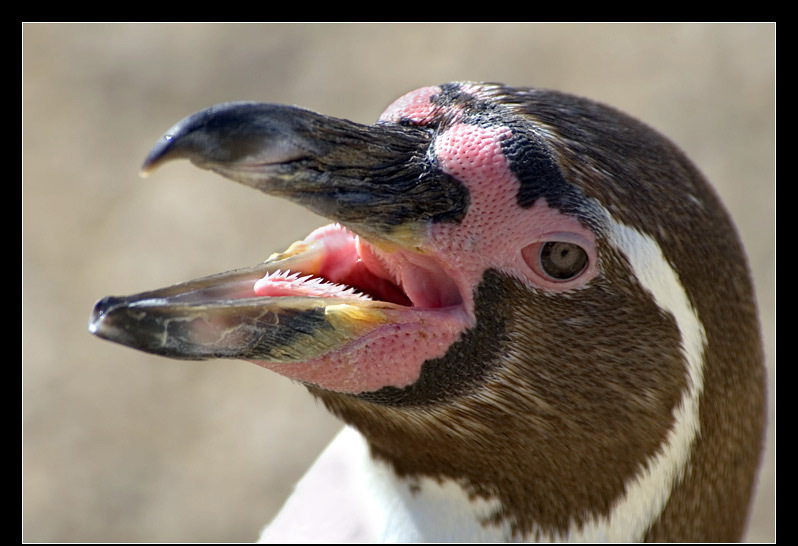 Birds have no teeth and penguins catch and hold their prey with their bill. Their head is connected to their rigid body by very mobile vertebrae. The bill has a osseous system, build up from the jawbone. It has several tight horn-plates from keratin, like our nails and hair. (see fig 1) And then many species have at the end a curved bill and the cutting edge is sharp. 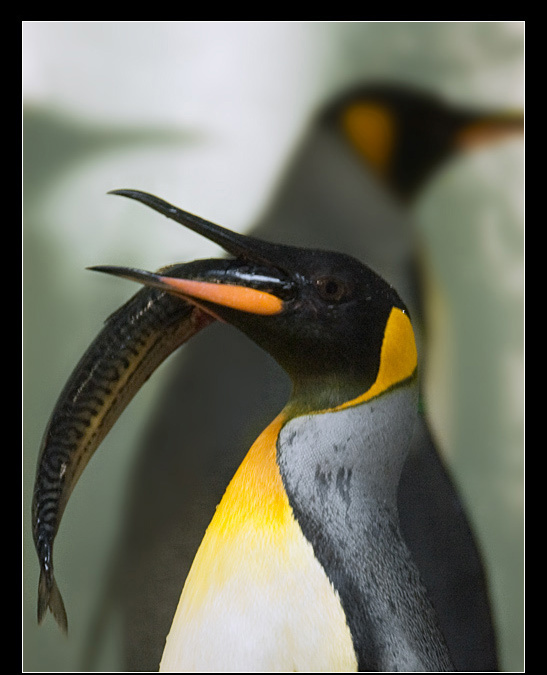 This allows a penguin to hold and kill a slimy fish. 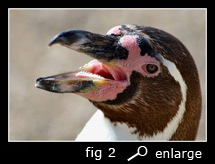 Because penguins have no teeth, they have to swallow their prey completely. By moving their head, they place their prey with the head forwards to the gullet, to prevent that fins get stuck. (see fig 3) The gullet can be opened very wide because the upper jaw is mobile with regard to the crown of the skull.